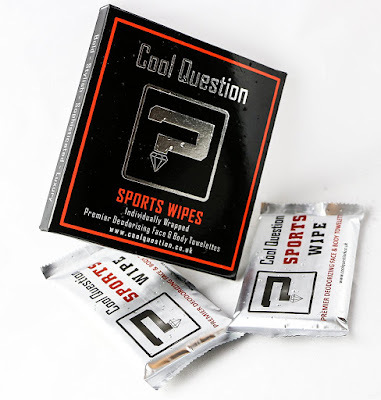 Home / Verbal / Cool Question Wipes - Sports - Luxury. Cool Question Wipes - Sports - Luxury. Cool Question products are bold, stylish and sophisticated. Their branding is an unapologetic statement of their intentions to provide affordable luxury hair, body and skin care products for the discerning customer. Sports Wipes. Premier Deodorising Face & Body Towelettes. The sports premier deodorising face and body towelettes are made from soft, strong 100% natural cotton. The towelettes help to remove unwanted dirt, sweat, bacteria, excess oil and bad odours. Infused with a cool mint fragrance, designed to cool, refresh, cleanse and revitalise your body, allowing your skin to breathe and feel instantly refreshed after use. Stay cool, confident and odour free with a simple wipe of the face, neck, body and other areas you need to refresh. The pack, which contains 4 towelettes are wrapped in a premium silver foil wrapping to help keep the towelettes moist, for when u need to use them. Also being travel and pocket friendly the towelettes are ideal for camping, travelling, sports or the gym without taking up any space in your bag or luggage. The towelettes performed so well in not only delivering a refreshing experience on the skin but also how good the scent actually smells and lifts your well being. Use during or after physical activity to wipe away any perspiration or odours, great for people who lead active lifestyles! Luxury Deodorising Face & Body Wipes. The 6 pack luxury deodorising face and body wipes are of the same concept as the towelettes, but are a wipe. To refresh hands, face or body in an instant whilst providing a pleasant cleansing experience with its added fresh-smelling fragrance. 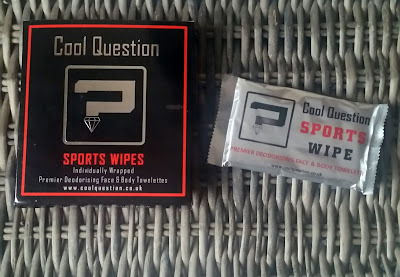 The wipes are also travel and pocket friendly and can be carried with you for an instant refresh if you are commuting, working or for after sports. The wipes instantly refresh and revitalise you, helping you face your next challenge of that day. You can understand how Cool Question products have been seen in the British GQ Magazine as they perform outstandingly and the products are travel convenient. Head on over to Cool Question to find out more about their luxury grooming and travel products. X Neil.